When Steep was announced back at E3 2016, gamers were surprised by the genre of Ubisoft’s new IP. 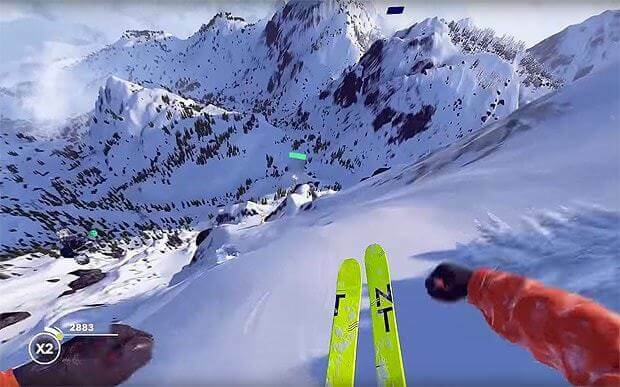 An extreme sports game set in a snowy mountain area seemed like a strange departure from the normal action-based open world titles the company is known for producing. Many were unsure whether or not Ubisoft could handle the intricate gameplay design that most sports titles require while maintaining their trademark open world setting. The result is something that falls somewhere between mundane and excellent. Steep succeeds in creating plenty of content for players to experience, however it struggles with creating an adequate balance of entertaining gameplay. 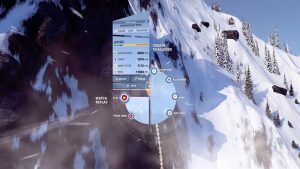 Steep is a very visually striking game with an impressive amount of detail. Every single mountain, from the peak to the base, is covered with a blanket of snow. Looking down at the surrounding area from one of the highest summits is an awe-inspiring experience. The sense of scale created by the folks at Ubisoft is second to none, even if the environment looks almost identical throughout the map. Smaller details like the tracks created from walking or snowboarding are certainly appreciated in a game like this, as it makes the world seem more real. The thrill of zipping down the side of a mountain while the snowy landscape blurs past the player’s peripheral is just… cool. Steep really looks incredible in motion. A beautiful world means nothing if there’s nothing to do in it, however Steep is filled to the brim with a variety of challenges for the player to test their skills. The map is sectioned off into different peaks, each having their own challenges and general difficulty. Each challenge is categorized by the four extreme sport types: snowboarding, skiing, paragliding, and wing suit jumping. One challenge may require clearing a ski route within a certain time limit, while another could have the player diving down the face of an obstacle-filled mountain. Clearing these challenges results in cosmetic rewards, including new coats, helmets, visors, snowboards, gloves, etc. There are enough options here to create a visually unique character, which serves as a fun distraction with no real influence on the gameplay. 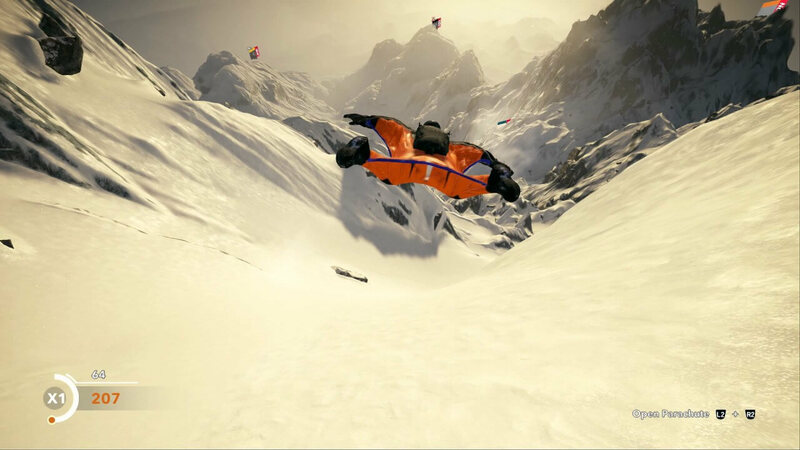 Steep is an online game, and because of that, the player will often run into random strangers while they are doing challenges or simply exploring. Joining these players is as easy as pressing a button within a certain distance of them, and doing so creates a group that can tackle the game’s challenges together. However, the real fun comes from the game’s route creation feature. Anytime the player travels from one area of the map to the other, Steep records the route traveled. That route can then be created into a challenge with its own set of rules. The freedom to create a challenge out of anything is spectacular, especially when it’s shared with players all over the world. Ubisoft did a great job of making the process remarkably simple, which is often a rarity for games with user created content. All it takes is a few presses of a button to make a challenge. While it’s clear that Steep succeeds in so many crucial areas, it disappoints on quite possibly the most important aspect of all: gameplay. The four extreme sports categories are not created equally when it comes to engaging controls. The worst of the bunch is the para-glider by far. The controls are awkward and frustrating at best, especially when considering its slow paced nature. The game grinds to a halt whenever the player is forced to use one for a challenge; not only is it an exercise in patience, it’s dreadfully boring. Outside of the challenges, there really is no reason to use the para-glider, as the other three methods of transportation are much faster. The snowboard and the skis sit at the other end of the spectrum. While neither control perfectly, they are certainly more engaging and fast-paced than the para-glider. There is a decent amount of fun to be had with winding in between rocks and trees, although a few minor annoyances keep it from being a blast. The snowboard feels like it’s glued to the face of the mountain, even going over a hill doesn’t launch you into the air. The only way to go airborne is by jumping, and while this certainly makes sense to a certain degree, it just feels strange at times. Steep clearly tries going for realism with most of its other mechanics, so seeing this kind of gravity-defying gameplay element is a bit odd. Turning, speeding up, and stopping are all handled by the control sticks, which works well at creating a fairly simple gameplay experience. First person view can be a harrowing experience. Wing suit diving sits somewhere in the middle. It’s easily the most adrenaline filled activity that Steep has to offer, combining high speeds with treacherous drops. While the sport is certainly visually impressive, controlling the wing suit just feels dull. It can also be a bit cumbersome when trying to regain height, especially on some of the less-steep routes. Luckily, the wing suit really isn’t meant to be used for a long duration. Challenges that require its use are often very short, with some lasting under a minute. It’s implementation seems like more of a novelty than an entertaining gameplay mechanic. Some major adjustments to Steep’s gameplay would make the game truly great, as it gets nearly everything else right. Ubisoft has succeeded in creating another gorgeous open world with plenty of things to do, especially with other people. Creating and sharing custom challenges is also extremely intuitive; the longest part of the process is running the route itself before it becomes a challenge. It’s just a shame that the fun can often be spread thin due to a lack of enjoyable gameplay mechanics. A game like Steep could really benefit from a refined sequel that addresses these gripes. Until then, there is still plenty to enjoy for gamers interested in extreme winter sports.